The World on 2 Wheels! Maybe you are on vacation right now, or maybe you have just returned from a fabulous holiday? Perhaps you are planning your next trip in the near future. There are countless destinations for you to choose from. Whether on your own rental bike or in a group throughout a prearranged guided motorcycle tour, we'll help you make your tour holidays memorable. Sincerely, Uwe Diemer and his ADMO team! ADMO offers two convenient locations near Los Angeles and Las Vegas where you can rent off-road and dual sport motorcycles to explore the southwestern United States off the beaten path. Rent a KTM 450EXC or Suzuki DRZ400S for your Mojave Desert adventure. Honda CRF 50cc to 230cc are available for family fun around your camp in one of the nearby riding areas. Roughly speaking, October to April is the best time to travel through South America. That depends, of course, on the specific area you want to visit. We offer some great deals on rental motorcycles or guided tours in Chile, Argentina, Peru and other countries in the southern hemisphere. But be warned, many dates are already fully booked for 2014/15! Your alternative option for next Winter is a motorcycle escape to Cape Town or Johannesburg. Select from a variety of motorcycle rental models to ride the beautiful Garden Route, explore the remote Drakensberg, or visit some National Parks. 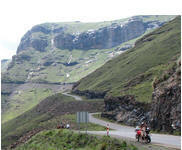 There is lots of great riding in South Africa! Copyright © 2014 AdMo-Tours, Inc.